As we move into the second half of life I hear women around me bemoaning the demise of their youthful looks, the advent of "laugh lines" and the relentless onslaught of menopause and all the associated miseries that come with it. What I'm coming to realize is that you can put a lot of time and effort into fighting the ageing process and trying to maintain all that vim and vigour of youth, or you can redefine beauty. I don't find a botox-ed, primped, preened and makeup laden older woman particularly beautiful. Yet, when I see a vibrant woman living in her own identity and investing in the lives of those around her, I am always brought up short in admiration and I'm often a little envious. 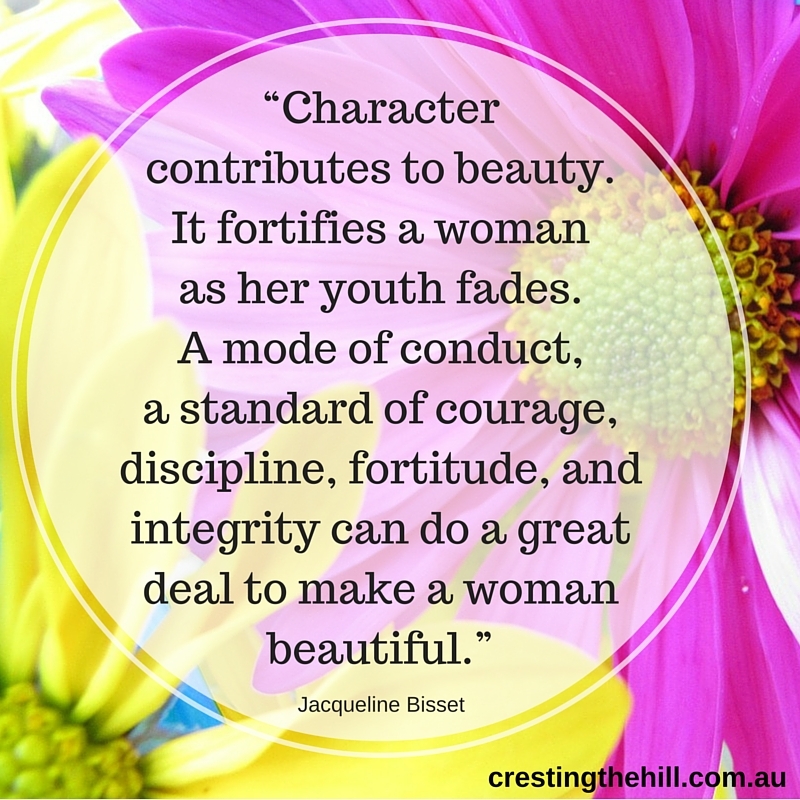 Two traits that are always shine out of this type of woman are integrity and authenticity. They're almost the same thing in some ways, but they also co-exist and enhance each other and can really make a mature woman stand out from the crowd. There are a lot of definitions out there for the word "integrity" but for me it always means that someone is honest and true to their values in all situations. I have no real problem with someone who openly goes about screwing people over - I know it is who they are and I expect it of them. I can be prepared and question their motives because I know what they're like. It is the person who you trust and who acts in a way that you never expected from them that shows a true lack of integrity. As I get older I feel the need to invest in relationships that I can trust. I don't want to make excuses for the "friend" who let me down or the workmate who went behind my back. I love people who do what they say they'll do - who "walk their talk" and who can be relied on to be loyal and caring. Part time friendships and people who are only there in the good times are just not part of my world any longer. I need to surround myself with people I can trust and who I know won't let me down (or at least not mean to let me down) because they care about me too. One of the benefits of getting older is that you start to get a real handle on who you are. I know what I like and don't like and I know what is important to me. My values are an integral part of my character and I know that I would never deliberately hurt someone or do something at the expense of another person's feelings. I love people who have accepted themselves and owned their flaws and who are out there living life as the individual they are - and not as a clone of who they think they should be. I bumped into an acquaintance the other day, she is married to a doctor and does her utmost to project the 'serene doctor's wife, perfect mother' persona, but you can see that she is struggling. When I mentioned to a couple of other people that I had seen her, they both remarked on how thin her veneer was and how easily it could all fall down if anything goes haywire. How awful to walk such a narrow line - to always be trying to be perfect or to be what your husband thinks you should be, or to be keeping up appearances. I want to celebrate who I am - flaws and all. I don't want to apologize for being the woman I am - I have value and worthwhile stuff to contribute to this world and being authentic is a big part of that. So let's celebrate this second half of life by being our own authentic selves and acting with integrity in everything we do. Let's not fall into the trap of people pleasing or self promotion or any of the other traps that are out there - instead be real and be proud of who we are as mature women ! Here. . . here! As someone who lives in the land of the plastic (LA) it's important to remind ourselves that integrity and authenticity are what make a person of any age beautiful. Love the quotes too. 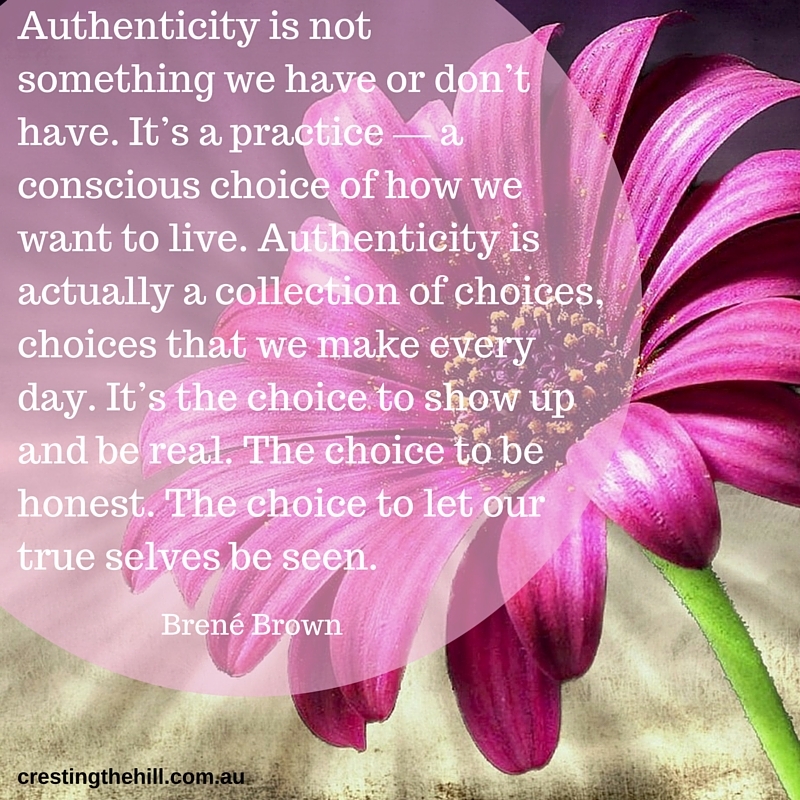 thanks Rebecca - authenticity is becoming more valuable as I get older. I'm really tired of fake people! We rely too much upon media sources to define beauty for us. True beauty is reflected in the eyes, because the eyes mirror the soul. The sad thing is that too many people compare themselves to photos of celebrities who've been airbrushed or plasticized, and they feel worthless by comparison. True beauty truly does come from within. I so agree with you Theresa - you can see beauty in women who would not be considered "pretty" but who have a genuine inner warmth that shines out - and that's way prettier! Integrity and authenticity... That's everything! Without them both, we're just pretending. I know several women who aren't authentic, and it's obvious they're not comfortable in their own skin. So sad. to reach our age and to still be pretending to be someone you're not is a really sad state of affairs indeed! Love it, Leanne! Be your best authentic self at any age. From Switzerland to Australia, it is great to be connected on the Midlife Blvd. It is indeed Pat - and I agree that it should be from any age but I think we truly start to embrace it at midlife - thanks for stopping by! I love this Leanne. I find as I get older I am less concerned about appearance and am coming into my authentic self. I went out to do errands today sans makeup! Sounds small, but something I would not have done in the past. I saw Carol Burnett this week on the Late Show and she looks like a freak with the extensive work she's had done. great post! I think that you and I are on a parallel journey of changing finally becoming the person we were always meant to be. I don't know about you, but for so many years my focus has been on everyone else that this time of life seems like a blessing because I finally have the time to sit back and consider what is best for me instead of children/husband/mom/dog. It seems like I've been waiting to get here for so long I want to take my own sweet time and think about it all for a little while longer, don't you? Yes Rena - I was asked what the best thing about midlife was and I said it was finding myself again after all the focus on others. Those people are still important but now there's breathing space to rediscover ourselves and I'm enjoying the process - who knows where we'll end up! Great post. So true that people who are true to themselves shine their light and that makes them beautiful. thanks for stopping by Suzy and yes it is definitely the key to beauty - especially as we get older! There are a lot of good things about growing older, it's a shame that we don't always remember them. Absolutely,...We need to let go of this obsession with looks..Of course, I don't say wanting to look good is a bad thing but there is more to us than just our looks and we need recognize and appreciate that! I so agree Nabanita - I think we all want to look as beautiful as we can, but what we have on the inside contributes a lot towards making us beautiful people as a whole. Leanne - I hear you! Can I be honest and say that I'm struggling to find people who live life the way you describe. I feel many women in midlife - at least around me - are just trying to hard to be something they are not or trying to catch up on lost time. I've lost many friends as I've moved into midlife because I've chosen not to put up with bull**** any more! I know girlfriends are important, but I seriously have more meaningful relationships with my men friends at this point. At least they're not pretentious. Authenticity and integrity are great qualities to practice, Leanne. It also takes courage in a world full of people pleasers who are afraid to go against the grain for fear of offending someone. Sometimes it is hard because it looks like being authentic might hurt someone :-) Human relationships are complex. But I agree that it becomes easier with midlife...and is the best part of growing. thanks Vidya - I agree that it can be hard to be authentic and not upset people - maybe that's why it gets easier as we get older because we are more in tune with others and less likely to tread on their toes. I think you have nailed it. The person that screws everyone over doesn't seem to infuriate me either as much as it did when I was younger because like you said, I am used to that behavior from them. That is who they are. The only difference is that I don't waste my time on them anymore. If you show me who you are, I am going to take your word for it and believe it. that is so true Kathy - I'm getting older and wiser and don't waste my energy on the people who aren't walking the same path as me! We live times when appearance is everything. I'm for wanting to improve, to become a better version of oneself. I'm all for any method that will help people feel better. That said, you have to feel good first before you can feel better. The problem about (exaggerated) surgeries and what-not is that people are trying to be something else. That's dangerous. Mainly because sooner or later they realize it doesn't change the content. That's so true Debbie - it's about owning who we are and then aiming to be the best we can as that person - not trying to be something that we aren't anymore! I still enjoy wearing makeup and getting dressed up but I am also comfortable in my own skin and don't feel the need to be 'made up' all the time. I like a bit of balance. Thanks Leanne for another great post about midlife and also for linking up with us at #AnythingGoes. I agree Sue - it's about being our best but being true to who we are and owning that and celebrating it! It's the way I live and I realized that I don't even have to try, I've been this way for good or bad my entire life! But I know many who are not. Great reminder to be...ourselves! 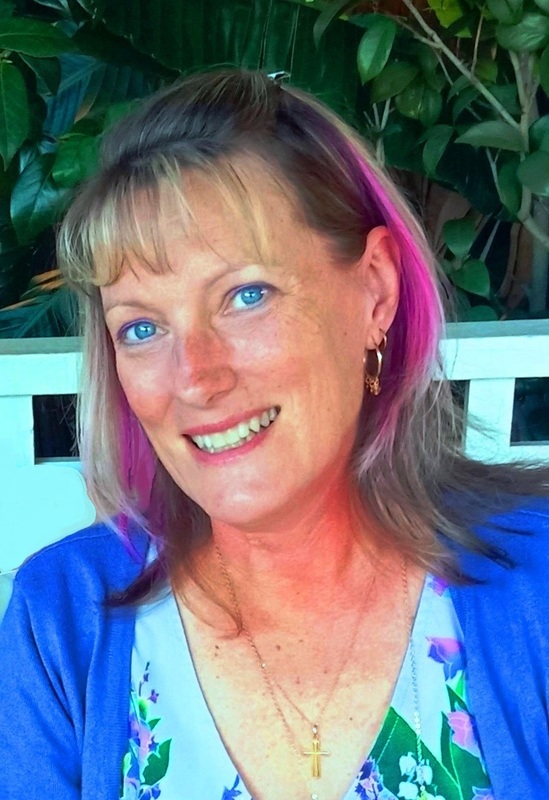 Hi Leanne, thanks for linking up on the Sunday Blog Hop. This is such a great post. I hope that many take these lessons to heart. Integrity has always been one of the most important things to me in my relationships.